I just watched ''The Battle For L.A. - Footsoldiers Vol.1'' and this is a good dvd. It documents the real hip hop scene. Shows the culture of hip hop in a true perspective. There has been so much of the race thing lately because of Eminem's comments when he was young. This dvd takes hip hop back to where it belongs--in the streets. If you have never seen a real street battle or if you have the thought that 8Mile showed you something, this dvd will expose you to the ''Real Street Battles''. With MCs from Cali highlighted in the dvd, you see why the eastcoast artist stay out east. Anyone of these 'street Soldiers could give any ''bling bling'' artist a tough way to go. You see the Battle Rap of these street soldiers, and you understand that the ''diss'' songs that are out are not really diss. The Battle raps on this dvd make you want more. Straight up battles without all the bling bling and the other phoney hip hop ornaments. The only ''dressing'' here is the pure skill of some of these MCs. The multi-racial make up of the soldiers proves race is not a factor in Real Hip Hop. Spitters of color, white spitters, latino spitters - male and female - and every facet of the spectrum show their skills. There is even ''Break''en''. The dance that most call break dancing; a very skillful activity and a main stay in the hip hop culture. A true form of expression. You get to hear the reason behind Battle Rap. And what it takes to be a Battle Rapper; from those doing the battles; the MCs themselves. And there is skill aplenty on this dvd. 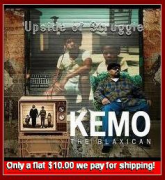 This is true westcoast Hip Hop, filmed and featuring where hip hop started: in the streets. All the ''burb'' hoppers and the younger hoppers who think that the bling bling of the eastcoast hip hop scene is the real hip hop , needs to see this. Those who are exposed to street battles will find this entertaining, and those not exposed or who have never experienced a street battle will definitely walk away with new knowledge. If there is any short coming in this dvd, it is the audio could have been a lil better and it could have been a lil longer. But then it would have been perfect, and nothing is perfect. This is as close as it can come though. Very informative and great perspective from the MC's view. A great inside look. On a scale of 1-10, I would have to give it a 9.